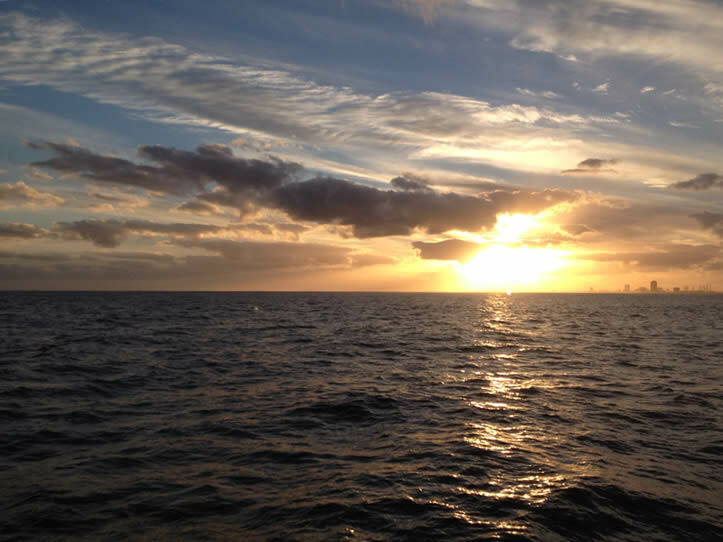 Our most popular trip is a 9 1/2 hour trip up to 40 plus miles offshore. Departs 7:00 am and returns at 4:30 pm. All of our prices include the cost of fuel - Boat is powered by twin diesels for safe, dependable & economic operation. Public Fishing Trips on "Island Girl"
Full electronics, private restroom, complete safety equipment and much more ! Welcome to AQUA SAFARI CHARTERS LLC Galveston, Texas. 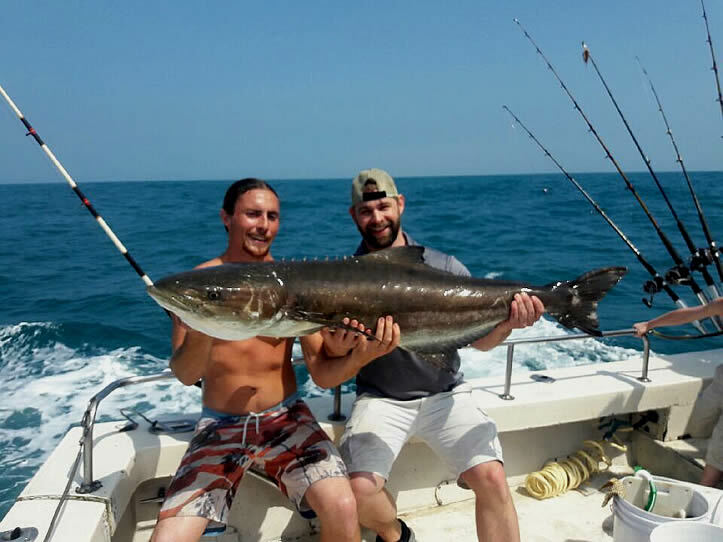 We specialize in offshore fishing charters, deep sea fishing charters, and Galveston jetty fishing for groups up to 18 passengers. 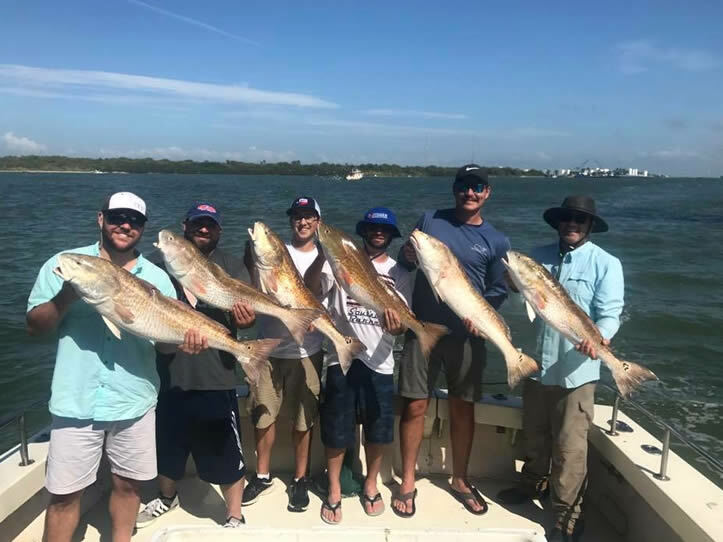 We offer fishing fun for families, friends, out of town guests, bachelor parties, business clients, organizations and corporate entertainment. 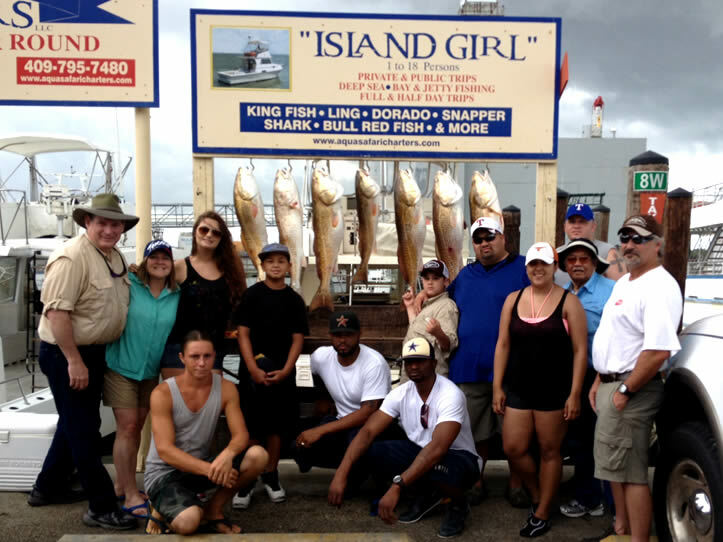 We provide some of the Best Deep Sea and Jetty Fishing trips on the coast. 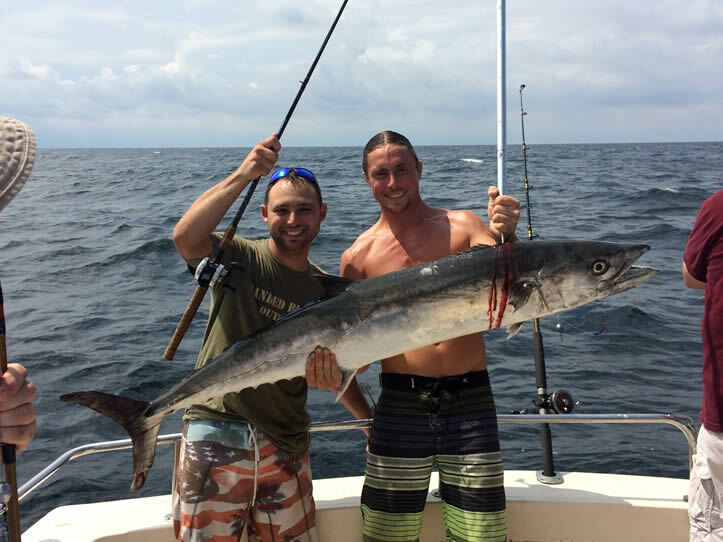 Catches on deep sea trips include kingfish, ling (cobia), dorado (mahi-mahi), a variety of shark, red snapper, mangrove snapper, lane snapper, spanish mackerel, and more. 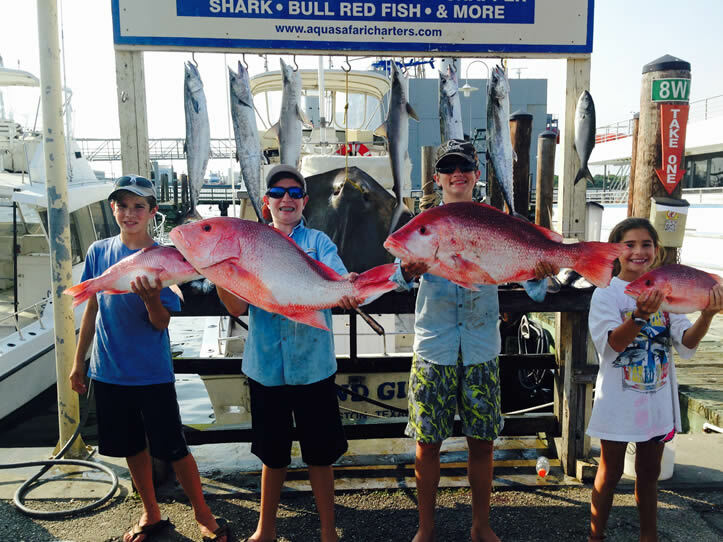 Catches on jetty trips include bull redfish, a variety of shark, black drum, spanish mackerel, gafftop, and much more. * 4 Hour public bay & jetty trips on Tuesdays only - mixed parties 12-18 people. Our most popular trip is a 9 1/2 hour trip up to 40 plus miles offshore. Trips depart at 7:00 a.m. and return at 4:30 p.m.
Six hour trip up to 20 plus miles offshore. Departs at either 7:00 a.m. or 2:00 p.m.
Four hour trips, 4 to 8 miles from dock. Departs at either 8:00 a.m. or 1:00 p.m.
9 1/2 hour trip up to 40 miles on most Monday and Wednesdays. Depart at 7:00 am. and returns 4:30 p.m.
On Tuesdays, a four hour trip departs at either 8:00 a.m. or 1:00 p.m. Within 3 miles of the jetties the Captain will position the vessel at rest for the scattering of ashes. A fishing trip is a great gift for anyone from an experienced angler to anyone fishing for the first time. 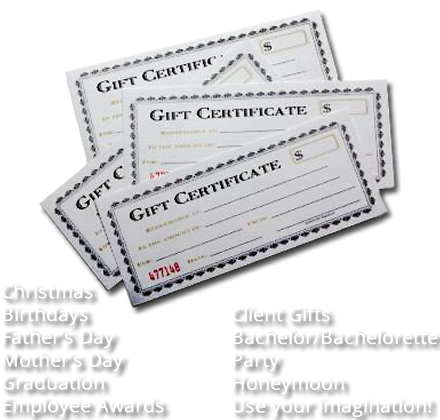 Our gift certificates make great gifts for any occasion and can be purchased in any amount. You can purchase a gift certificate to cover the cost of a single or multiple tickets on a public trip, or a complete private charter. It’s nice to bring along friends to enjoy the experience. Individual tickets start at $50 and range up to $125. 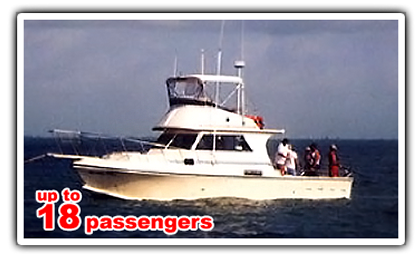 Our private charters start at $625 for up to 6 persons and can accommodate a maximum of 18 persons. Gift certificates can be used just like cash for any trip. Gift certificates can be handled by phone order. Just call 409-795-7480 and use any major credit card for convenience, or send check or money order and the gift certificate can be mailed to you or picked up from our Galveston office. The “Island Girl” is docked at Pier 19 just 2 blocks from Harborside Drive and near downtown Galveston and the Historic Strand area. From Houston – Travel south on Interstate 45 (Gulf Freeway) to Galveston Island. Upon crossing the Galveston Causeway, take the very first exit, Harborside Drive. Go left under I-45 on Harborside Drive. Continue along Harborside Drive to downtown Galveston and the Historic Strand area. At 20th Street (left turn signal) take a left onto 20th Street, go one block to the next corner and turn right. Pass the seafood markets and shrimp boats to Slip 8W for the “Island Girl”. You will see our Aqua Safari Charters, LLC. sign at our slip. Parking for the day is just beyond our location to the right in the Pier 19 parking lot. From Bolivar Peninsula – PLEASE RESEARCH FERRY WAIT TIMES TO BE SURE YOU ARRIVE ON TIME FOR DEPARTURE. Take the ferry from Hwy 87 to Galveston Island. After departing the ferry, travel down Ferry Road (Hwy 87) and turn right on Harborside Drive (Hwy 275). At 20th Street turn right. Go one block to the next corner and turn right. Pass the seafood markets and shrimp boats to Slip 8W. 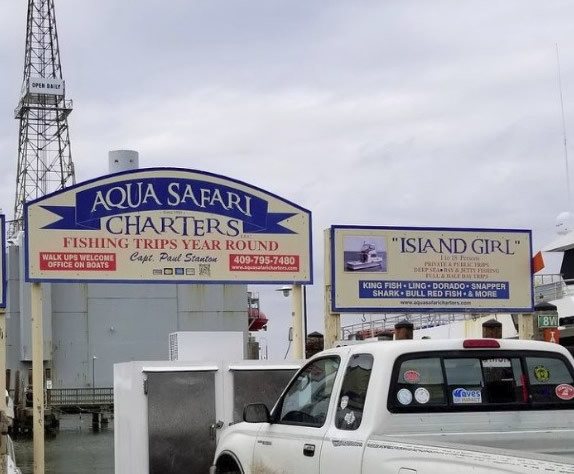 You will see our Aqua Safari Charters LLC sign at our slip. Parking for the day is just beyond our location to the right in the Pier 19 parking lot.